Ireland’s woodland treasures are the star of a new TV show. 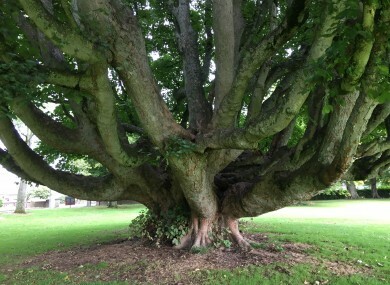 The Champion Sycamore at Gormanston College, Co Meath. IF YOU GO down to the woods today – you may just extend your lifespan. A new TV series on Ireland’s incredibly rich woodland heritage hits TG4 tonight, making the case for us to open our eyes to the treasure on our doorstep. We are all aware of the contribution tree-filled landscapes make to our air quality but a more subtle benefit is the effect they can have on our mental health. A study of Japanese office workers proved a link between decreasing stress levels and spending time in a wooded area. The study’s authors at Chiba National University recorded a 13% drop in the stress hormone cortisol following a walk in the woods; the activity also reduced blood pressure rates and heart rates and increased powers of concentration. Manchán Magan traversed the country’s forest trails for Crainn na hÉireann, a ten-part series on Irish trees which begins tonight on TG4 at 8pm. Gleann Bheatha means Glen of Birch, and there are numerous examples of this beautiful, slender native tree to be found in this lonely valley in Donegal. The castle gardens are crammed with exotic tree species, though the natives are well represented too. A splendid trembling aspen in the gardens, and a now rare stand of wych elms at the top of the valley by the waterfall are among the high points. The lakes, mountains and waterfalls are justly famous, but the trees of Killarney are spectacular too. Start at Muckross Abbey to see what might be Ireland’s most beautiful tree – the Muckross Yew, standing proud in the centre of an ancient stone cloister. Then visit eerie Reenadinna Yew wood, one of the few yew woodlands in Europe. These ancient trees have colonised an outcrop of limestone boulders on the edge of the lake. Nearby is Brickeen Bridge where the two lakes meet, with some fine examples of arbutus, the rare native tree that is relatively common in Killarney, and alongside them are pygmy willows and Scots Pines growing in rock crevices by the water’s edge. The King Oak is undoubtedly the star attraction of this estate that lies on the edge of Tullamore town. The trees stand sentinel right inside the imposing entrance, a massive giant of a tree with its low branches spreading out majestically, propped to prevent them falling. Deeper in, the forest is one of the biggest pendunculate oakwoods in Ireland, with yew trees laid out beside the castle in the shape of a Union Jack. Combine your trip here with a visit to Birr Castle, a marvellous tree collection, including the imposing Carroll Oak, the fallen trunk of Europe’s champion grey poplar and the tallest hedges in Ireland. The Garden County is the spiritual home of Irish trees. Powerscourt, Avondale and Glendalough are all famous for their forests, but Kilmacurragh, the rural branch of the National Botanic Gardens just off the N11 south of Wicklow town is a hidden gem. Head gardener Seamus O’Brien is an expert on exotic species: there is a towering redwood and the rhododendrons are magnificent in early summer. But Kilmacurragh boasts marvellous natives too. A yew walk leads down from the lake and then at the bottom of the hill turn right to find a superb avenue of oaks leading up to the skyline. Take the Kerry Way footpath towards Kenmare, up by Torc Waterfall and then through Ullauns, a pristine forest that is one of the few undisturbed sessile oak woods in Ireland. Ultimate peace. The home of tree-writer Thomas Pakenham near Castlepollard is an under-visited estate with some superb examples of Western Red Cedar, an imposing avenue of beech and oak and the Squire’s Walking Stick – an unusually tall, straight oak tree featured in Pakenham’s bestselling book Meetings With Remarkable Trees. There are also numerous Oriental collections, grown from seeds gathered in China and Tibet by Thomas Pakenham himself. Email “6 wonderful walks in the woods to take this week”. Feedback on “6 wonderful walks in the woods to take this week”.